Here you will find resources on the rights of you and your family members to live in Scotland before, during and after the Brexit transition period. If you are an EU citizen living in the UK, then in order to secure your rights to remain here after Brexit, you will probably need to apply for the new “Settled Status”. How to do this and what are the currently known key dates and facts? Find out more by reading our Settled Status Guide (updated March 2019). Applications are now open for the Settled Status Scheme, this opened on 30 March 2019 with a deadline for applications of 30 June 2021. You can find more about how to apply by downloading the UK Government’s guide here. The UK Parliament has not accepted the government’s plan for Brexit. This means that the UK might leave the EU without a deal. The UK government announced it would implement the ‘Settled Status’ scheme in the event of no deal – with some changes. Read in detail: Policy paper on citizens’ rights in the event of a no deal Brexit. If you are still unsure how to apply for the Settled Status, you can find more information by visiting freemovement.org.uk – a website run by legal specialists, offering updates, commentary and advice on immigration and asylum law. As part of your “Settled Status” application, the UK government will check if you have been resident in the UK. What to do if the checks don’t work? Check the list of documents you can provide here or read this explainer article by freemovement.org.uk. This factsheet provides a brief summary of the rights of you and your family members to live in Scotland before, during and after the Brexit transition period. This Information is intended for guidance only and was reproduced from information from The Human Rights Consortium Scotland, JustRight Scotland & Scottish Universities Legal Network on Europe. Most of the sections on this page explain rights of the EU citizens who currently live in the UK. Those EU citizens who will arrive to the UK after a certain date (depending on the result of negotiations) will probably have different rights. Read here: Government outlines no deal arrangements for EU citizens. 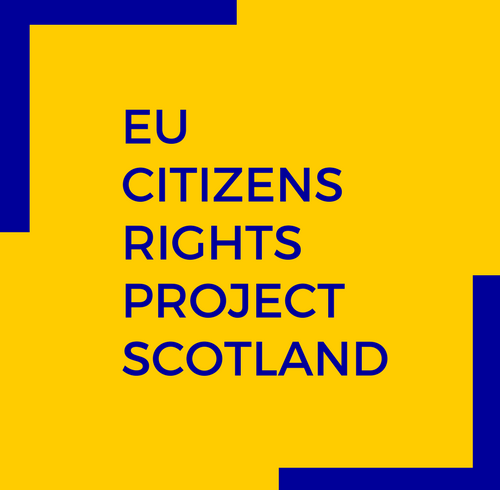 Scottish government has published a webpage about EU citizens’ rights and the Scottish Government position on the ongoing EU-UK negotiations. The page includes links to more resources and reports on EU citizens in the UK. You may sign up to Home Office newsletter about European Union citizens’ rights and the “settled status” scheme. It will send emails about new arrangements on EU citiznes’ rights directly to your inbox. Read about the UK government’s information campaign about your right to reside in the UK. The link contains a video about the “Settled Status” and some case studies of applying for the new status. The page’s aim is to provide information to help EU citizens make their own decisions about their current situation in the UK in light of Brexit. Do you qualify for Settled Status and what is the best course of action for you? A quick quiz by SCVO, Scottish Council for Voluntary Organisations. A user-friendly overview on what is settled status and who needs to apply, including useful definitions and lists of necessary documents. ! This website is run by volunteers and may contain mistakes.